Background: Mathematical models exist that quantify the effect of temperature on poikilotherm growth rate. One family of such models assumes a single rate-limiting ‘master reaction’ using terms describing the temperature-dependent denaturation of the reaction’s enzyme. We consider whether such a model can describe growth in each domain of life. Methodology/Principal Findings: A new model based on this assumption and using a hierarchical Bayesian approach fits simultaneously 95 data sets for temperature-related growth rates of diverse microorganisms from all three domains of life, Bacteria, Archaea and Eukarya. Remarkably, the model produces credible estimates of fundamental thermodynamic parameters describing protein thermal stability predicted over 20 years ago. Conclusions/Significance: The analysis lends support to the concept of universal thermodynamic limits to microbial growth rate dictated by protein thermal stability that in turn govern biological rates. This suggests that the thermal stability of proteins is a unifying property in the evolution and adaptation of life on earth. 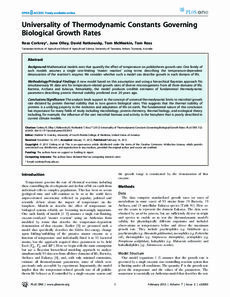 The fundamental nature of this conclusion has importance for many fields of study including microbiology, protein chemistry, thermal biology, and ecological theory including, for example, the influence of the vast microbial biomass and activity in the biosphere that is poorly described in current climate models.